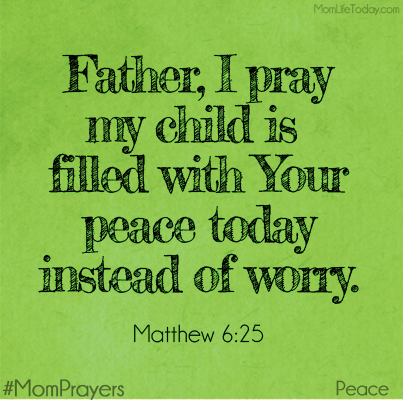 A Mother’s (and Father’s) prayer. Hello everyone, and welcome to this week’s Prayers for the Week post. It seems like the worry that we all feel in our lives keeps getting worse and worse, doesn’t it? Worry for our kids, worry for our relatives, worry over how messed up the government is, the list goes on and on! In this passage of Scripture, Jesus is telling his Disciples — and all of us, for that matter — not to worry so much about where things will come. As you continue to read the passage, you find comparisons to the birds and the grasses and the flowers, and you realize that Jesus is telling us not to worry so much about what we need — but rather, to give up our worries to the Lord, and He will take care of us. My friends, these are incredibly difficult times for all of us, and as crazy as it sounds to the non-believer, the best thing we can do is to give up our worries, our fears, our concerns to the Lord. Pray with all your heart, believe it will happen, believe in Jesus that He gave Himself up for us to save us — and my friends, you will feel the Peace of God descend upon you, and it will be a Peace unlike anything you have ever felt. Now, please pray for these prayer requests so that those that need them can be lifted up by our prayers. Chelsea left this comment in our previous post. Here is what she wrote:Praying for all the above prayers! If I could add a dear friend to your list she has been struggling with many different illnesses ranging from Pneumonia,Calciphylaxis…She’s been in and out of the hospital since last may…We have been praying God works miracles in her life but she was just put back in the hospital Saturday night with pneumonia,infected tissue where she had surgery, heart arrhythmia,and a UTI… She means the world to me.. Thanks! My friend Bambi asked for some prayers for her dad. Here is what she wrote:I would like to add my dad to this weeks prayer list. I’m sending this message from the hospital waiting room, he is going back for surgery soon. He is having his knee replaced. It’s a pretty extensive 5 hour surgery, there isn’t much left of his knees and it is being replaced by donated cadaver. I pray that The Lord looks after my dad and eases his nerves. That He guides the doctors hands and that dad has a fast and speedy recovery.You’ve got it, Bambi! I’ll add that to the list right now. For starters, I’ll add my prayers to yours that your Dad has a very successful surgery, that God guides the hands of his doctors, and that you all have Peace and comfort and strength to be there for your Dad as he needs you. We also give praise to God for procedures like this — while a risk, still it is a blessing that this is able to happen to improve the quality of life for those that struggle! In Jesus’ name we pray with Thanksgiving every day! Amen. Please pray for my friend Rusty and his wife Elise, who are expecting their second child. Elise is also fighting cancer. She will soon start chemo. Please keep them in your prayers.Lord, please keep your servants Rusty and Elise from harm; lift them up and take away any fear and anxiety that they might have. Bless them as you have with a healthy baby, their second, but please help Elise’s doctors treat her properly — guide their hands so that she may be around for many years to come. Grant them the Peace that only you can give them, as well as comfort and strength to face the challenges ahead. It’s in the name of Your Son Jesus that we pray with thanksgiving. Amen. My sister Robin’s pastor is speaking at an event. Here is his information from Facebook. Pastor Chip writes:In Bandra speaking to group of leaders from Bollywood & Mumbai’s business community. Topic is”Can Man Live Without God?” Please pray for us!Lord, lift up Your Servant Chip today as he speaks about how futile life is without You in our lives. Be with him, may his journey be safe, but more importantly, may his words be Your words, and may they lead to many saved souls for You today! It is in Jesus’ name we pray with thanksgiving! Amen.Thank you, everyone! Please continue your prayers for Uncle Ted and Uncle Bob. Uncle Ted has started his treatment, and is in some pain, but that’s all I know. Uncle Bob is in Hospice care in Goldsboro, but has made some recovery so he is not in as much discomfort as he was. Please continue to lift up these strong Christians, and pray also for Aunt Connie (Uncle Ted’s wife), Aunt Clara (Uncle Bob’s wife), and all of their family. Pray for their strength, peace, and comfort in the days ahead. Thanks everyone, it means the world to me! Continue your prayers also for my friend Kourtney’s nephew, who had a successful surgery but needs more in the days and weeks ahead. Having heart surgery at 2 days old is really hard, but with God’s Guiding Hands leading the surgical team, it was successful. Thanks everyone! Hey everyone! Thanks for the prayers and kind words. I am home from the ER after an 8 hour visit and 2 CT scans , I have a wonderful (sarcasm) stone that has taken up residence in my left kidney. I also have an unknown mass on my kidney and have to see a urologist next week. This has been the most painful thing ive experienced, and I have had 2 children! So keep those prayers coming that this stone gets bored soon and wants to move on, and that I have a good outcome at the doctors next week. Thanks everyone!! As I said, huge praises for Kourtney’s nephew! He is not completely taken care of right now, but with God leading the way, he will be before you know it, God willing! Huge praise as well for Bambi’s Dad, who had successful surgery and is on the road to recovery! Praise also for the men of The Men’s Study Bible Study, who are helping this sinner in his comprehension of the Word of God each and every week! Praises also to all the Mama’s of the Girls of Grace Bible Study that Sophie participates in — they are a blessing to our church, and to each and every one of the girls! Praise also for Sophie and her dance group at Church, who will be dancing during both traditional services today, and also for Miss Sarah, who leads them each week! My friends, praise also goes out to each and every one of you! It is because of your prayers that so many of the praises are able to be lifted up! I am a strong believer in the power of prayer, and with all of these prayers, we have some complete miracles happen, so thank you for staying strong in the Faith and lifting these prayers up each and every week like the Prayer Warriors I know you to be! May you have a wonderful week, and we’ll talk to you next week!